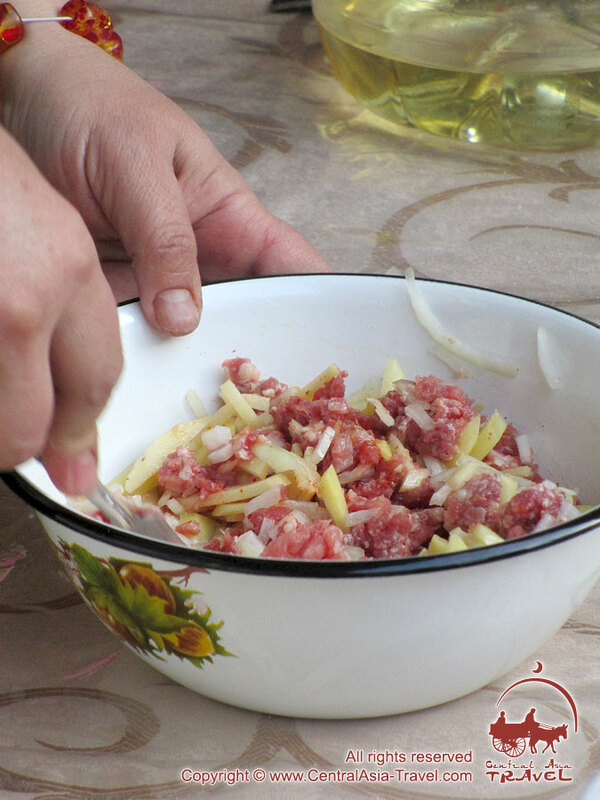 Khanum is a steamed floury dish of Uzbek cuisine with a stuffing of potatoes or minced meat. 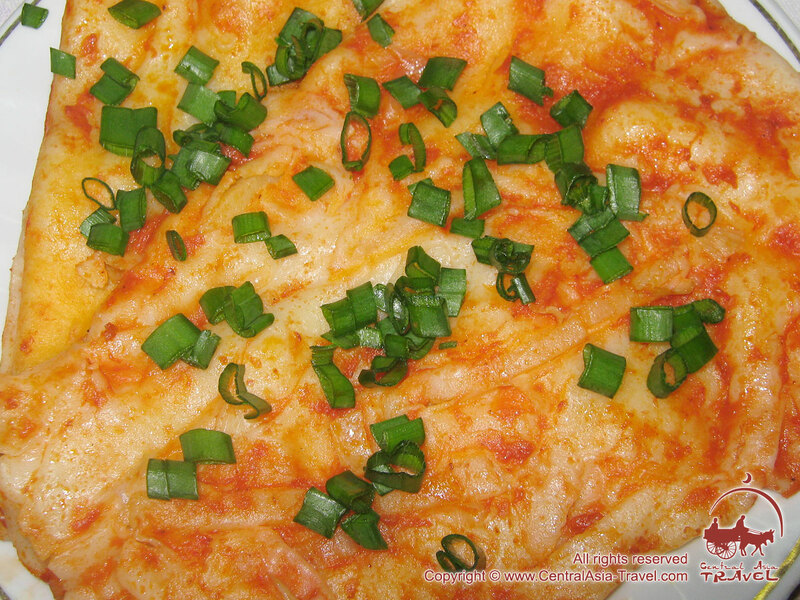 The zest of this excellent dish is the combination of finest dough and juicy filling. The skillful hands of Uzbek women make khanums of various forms - these are elegant roses, lace envelopes, and just rolls. 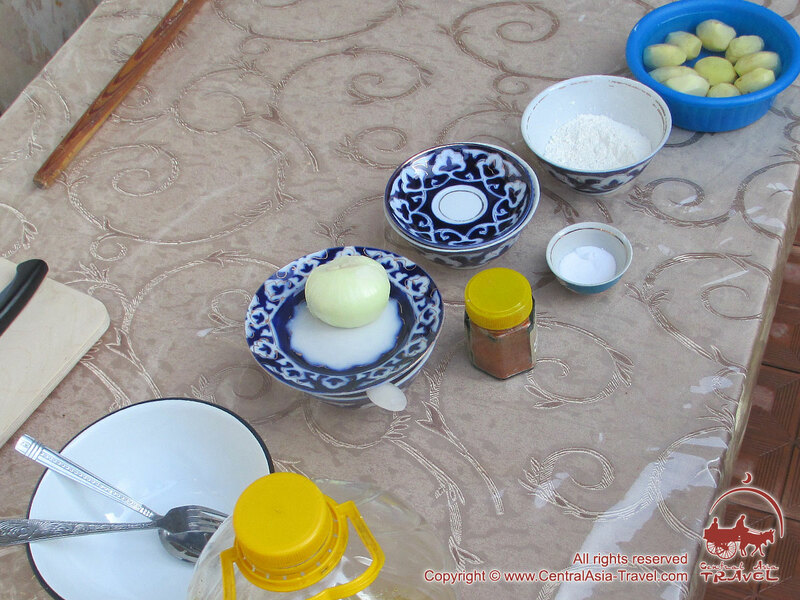 In the Uzbekistan bazaars, they sell ready-made khanums with potatoes (very tasty!). 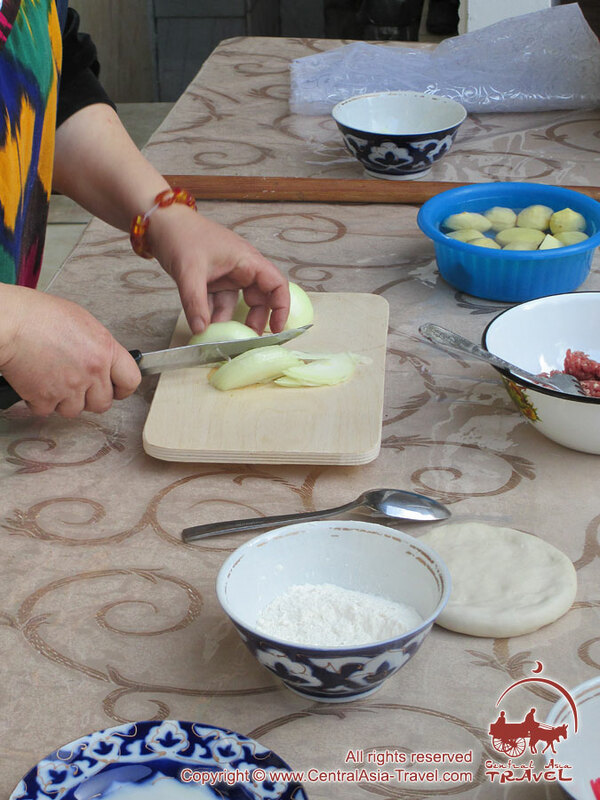 The recipes of the khanum are so diverse that even the respected elders - aksakals - do not remember whether there was originally minced meat in khanum or only potatoes. Today, opinions are finally divided: someone claims that only potatoes are put in the real khanum, and if meat is added, then khanum becomes manti. 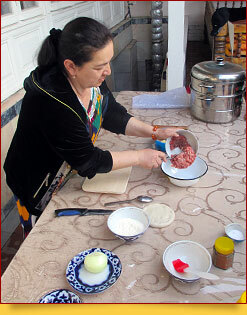 Others assure that in their family, khanum was always cooked with meat. 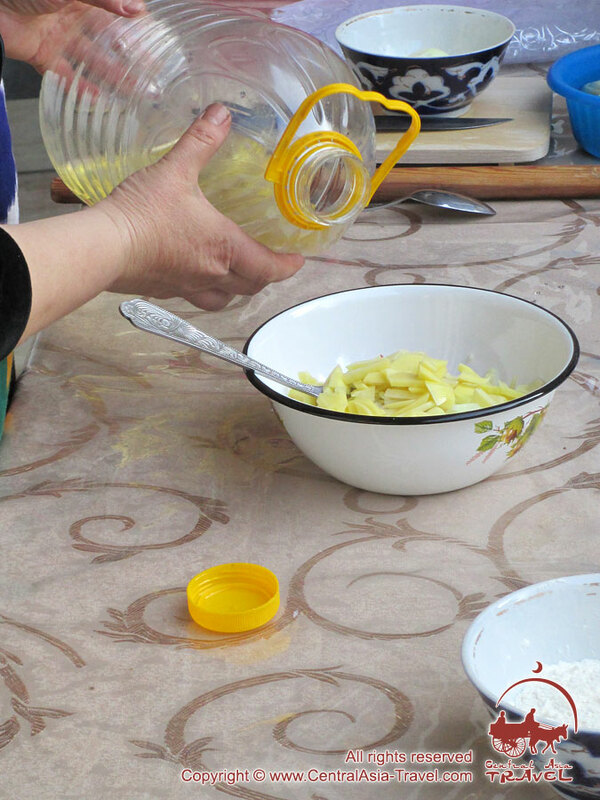 We agree that the stuffing for khanum can be any - either minced meat with potatoes, or vegetables only (pumpkin, potatoes, carrots, onions and even cabbage) - a combination of rich imagination of the hostess and gifts of Uzbek nature provide a wide variety of stuffing. The recipe for cooking khanum is very similar to the recipe of another Uzbek dish - manti. However, khanum is khanum, and manti are manti. "The East is a delicate matter”, you see. We don’t know whether this is truth or lie, a fairy tale of the elders or fact, but there is a legend about how the khanum was invented. The situation was very banal. The head of the family returned home unexpectedly (from the war or hunting - the legend does not specify), and there was still no ready-made food in the house. 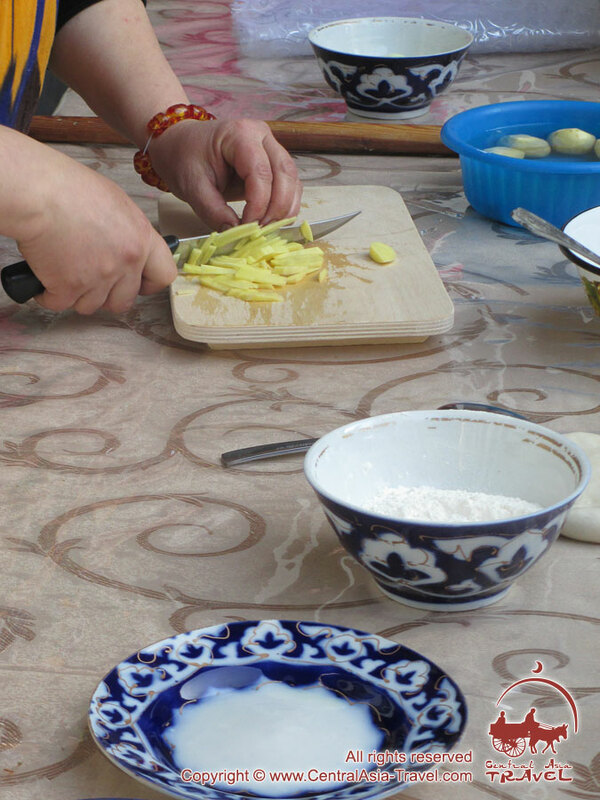 The head of the family has not been seen for a long time, so everyone was happy and eager to please him with delicious dinner, but his favorite dish – manti was too long to cook. It’s only modeling that takes loads of time. 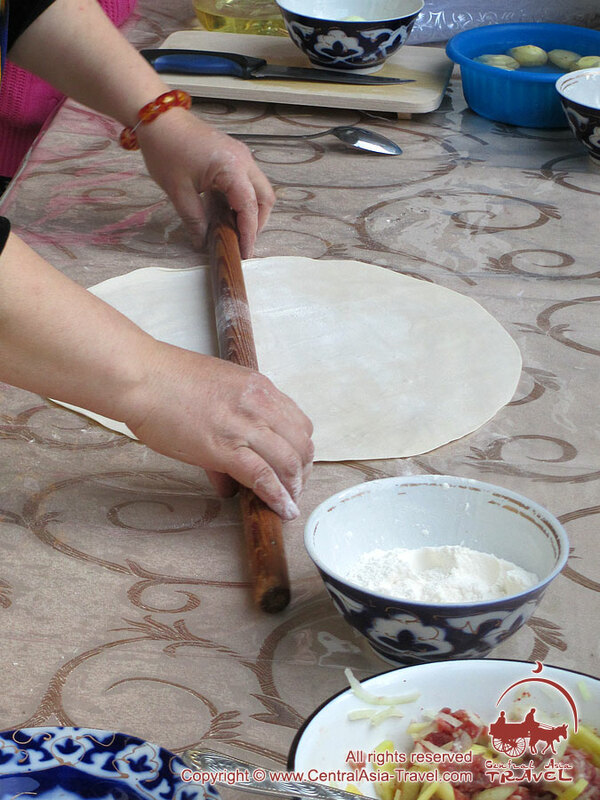 And then the hostess whipped the dough sheet, put on all the stuffing and rolled up the roll, and cut it into pieces after cooking - if you close your eyes, then the taste is very similar to the manti, indeed! 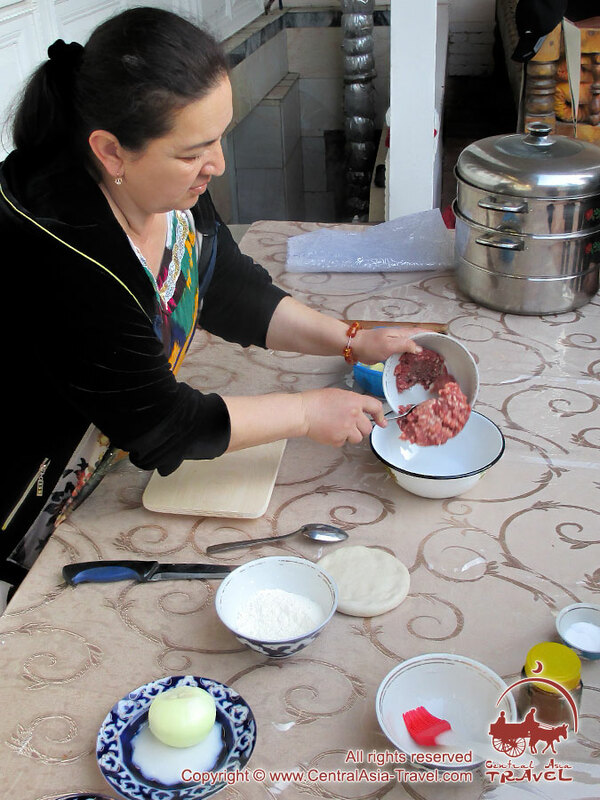 Whether the mistress was lazy or, on the contrary, very smart, but the new recipe entered the life of the locals so fast that the khanums became an integral part of the Uzbek cuisine. 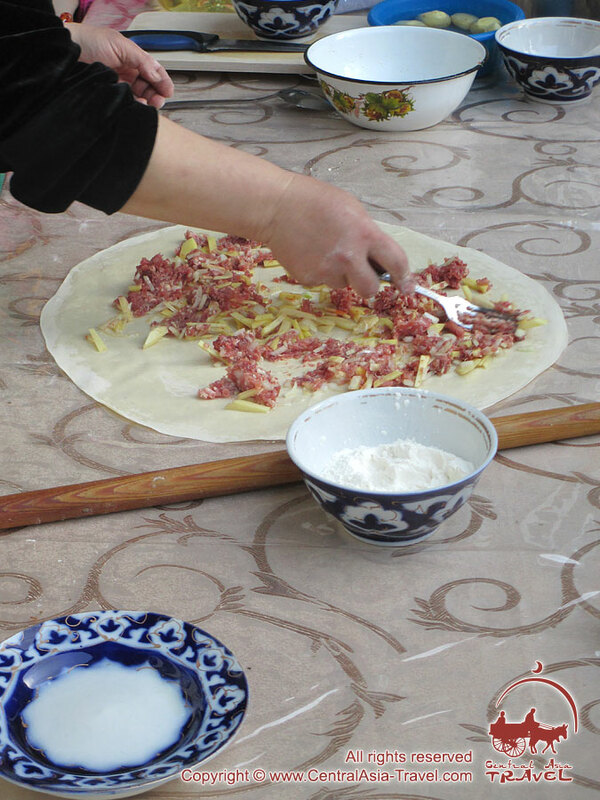 That lady was called Khanum (“mistress”), so they began to call this dish after her, and because of the simplicity of cooking the dish was called "lazy manti". 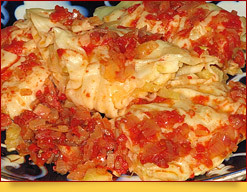 Classic khanum is made with potatoes and onions (potatoes are cut into thin strips, onions are finely shredded). • You can add carrots, potatoes (optional). Meat stuffing can be used raw, but you can pre-fry, then cool it and start modeling the khanums. 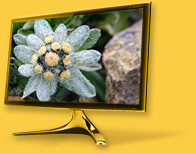 • 3 tablespoons vegetable oil. • A small bunch of green onions. 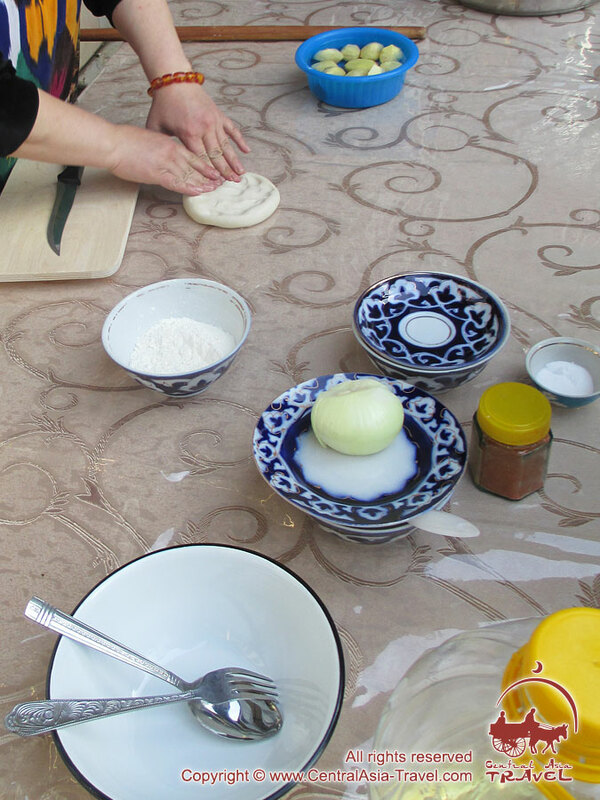 In many flour dishes of Uzbek cuisine, the egg is not put into the dough. However, sometimes an egg is added - even here, in Uzbekistan, there is no consensus on this. 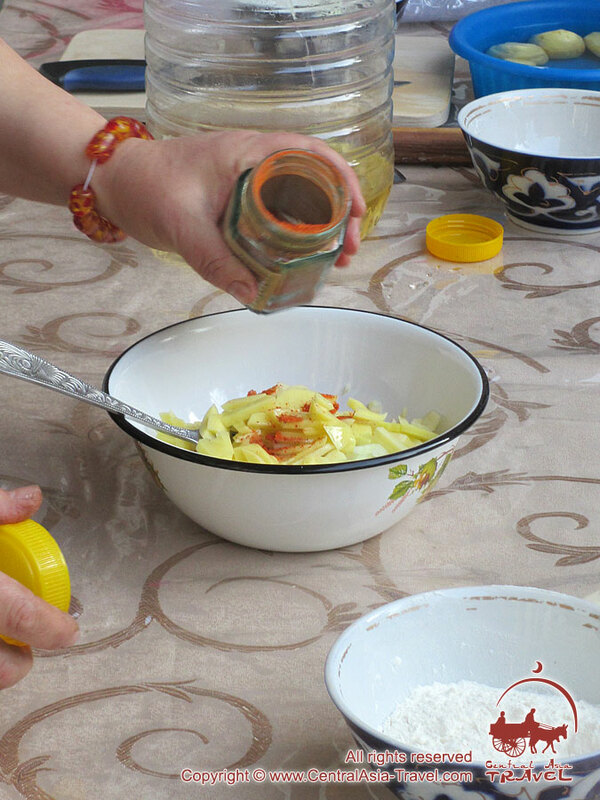 The number of ingredients in grams and names, different options - whether it should be fried or laid raw, or only some ingredients (onions, carrots)shoul be pre-fried - can vary. In every region of Uzbekistan there is a local recipe. 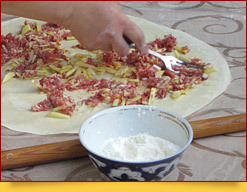 As we mention above, the forms of khanum can be absolutely different, therefore, one cuts the dough differently. The easiest is to make a swirl. 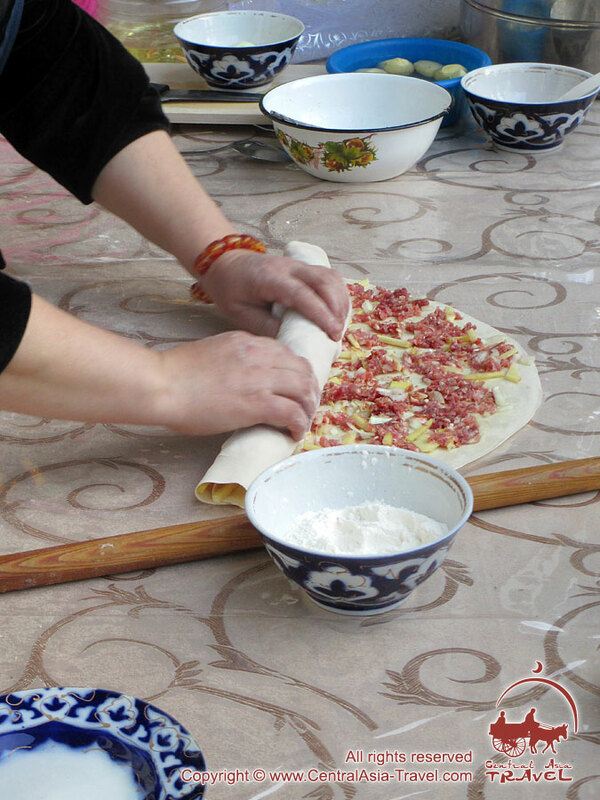 To do this, roll the dough - the thinner, the better, distribute the filling on the surface evenly, put a bit of butter on top and roll it. To get everything steamed evenly, make a few light turns. 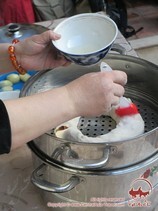 Khanum is cooked in cascan (steamer) for about 40 - 45 minutes. If the filling is with meat, it is better to hold it for a little longer - about 50 minutes. Before putting the khanums onto a streamer grill, better grease it with oil. 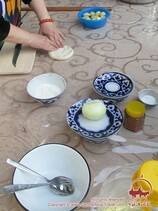 Ready khanums are laid on a dish in layers: each layer is poured with tomato sauce (tomato paste diluted with water so that the consistency was thicker than that of tomato juice, brought to a boil and added with vegetable oil), sprinkled with onion rings, mixed with spring onion and dill . 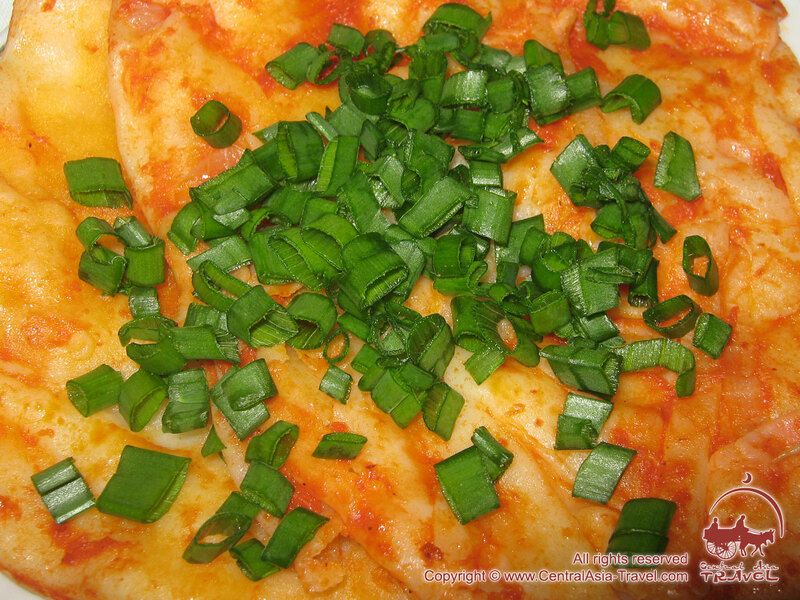 It is tastier if the onions for sprinkling get pre-marinated. Cut them into thin rings, and soak them separately in a mixture of small amount of table vinegar dissolved in boiled water, a little salt, sugar. The longer it soaks, the better it gets (3-4 hours is enogh, it can be much less, but in this case the bitterness of the onion can still remain). They eat khanum, like manti, with their hands. Do not be shy, it’s much tastier this way!